Halogen glödlampor av Japanskt kvalitet Ersätter valiga glödlampan, lyser lika starkt .. Very strong, bright. Nice super white color, xenon-look. Works much better than cheap chinese LED.. Fits all European Vehicles w/ 37mm Festoon Bulbs. C5W NOTE! Very strong, bright. Nice super w..
Good price, very bright xenon look LED festoon lamp. 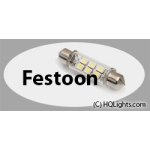 12V 6 x SMD LEDs Low hea..
Good price, very bright xenon look LED festoon lamp. Canbus - Error Free (on most cars bu..
Lyser starkt. Ej CANBUS, på modernare bilar kan ge felkod att glömlapan är trasig. Detta händr of..
Good price, very bright xenon look LED festoon lamp. Canbus - Error Free 12V ..
Good price, very bright xenon look LED festoon lamp. No canbus. Canbus - Error Free..
Good price, very bright xenon look LED festoon lamp. No canbus. 12V 6 x SMD L..
Good price, nice LED lamp, very bright. We ave also reports that it does not work 100% all on.. Bright white LED. Not CANBUS compatible (apply only for newer cars). May give error code on new c..
Color: Blue white (xenon look) C5W 12V / 10W Included: 2 x lamps in..